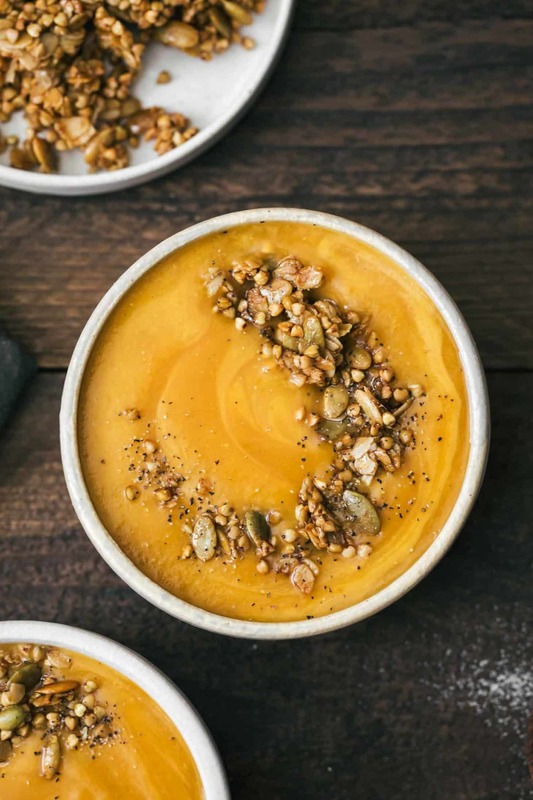 Coriander Sweet Potato Soup with Buckwheat Granola | Naturally. It feels as though every year I come up with a new sweet potato soup recipe that becomes my new favorite. I have a smoked paprika version, a turmeric version, and now this coriander recipe. This soup is so good, though, that it would have been sad not to share. 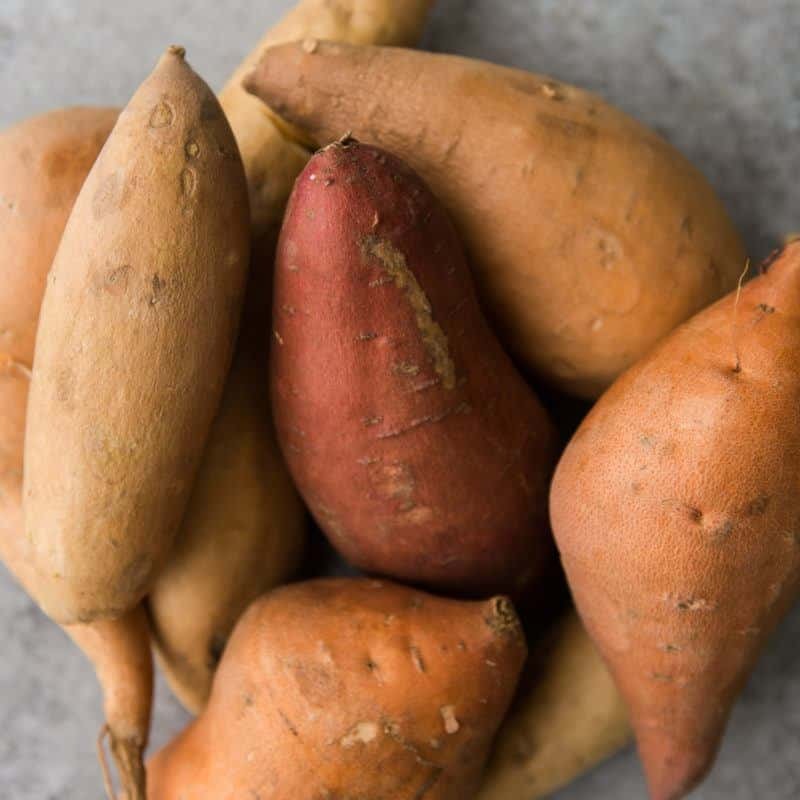 The combination of coriander with a faint cinnamon undertone works amazingly well with sweet potatoes. Add to this, my current granola obsession and you have a perfect fall meal. I would recommend making a big batch of this granola. It’s not on the sweet side but it plays equally well with this savory soup and a more sweet yogurt parfait. You could also spice it up a bit and add your favorite flavorings, like cinnamon, to the mix. A beautiful fall soup that features sweet potatoes paired with coriander and cinnamon for a warm, comforting soup. In a pot combine the ingredients for the soup, through 3 cups of the vegetable broth. Bring to a boil, reduce to a simmer, and cook until the rice and sweet potatoes are tender. Pour the soup into a blender and puree until smooth; adding more broth as needed. Transfer the soup back to the pot. Bring back to a warm temperature and stir in the lemon juice followed by the heavy cream. While soup is cooking, heat oven to 325˚F. Combine the oats, buckwheat, and pepitas in a bowl. Warm the coconut oil, brown rice syrup, and salt together in a small pot or bowl. Pour over the oats and stir until the granola is well-coated. Spread into a thin layer on a sheet tray. Bake, stirring once or twice, until the granola has browned and is crisp. Remove from oven, let cool, and break into pieces. 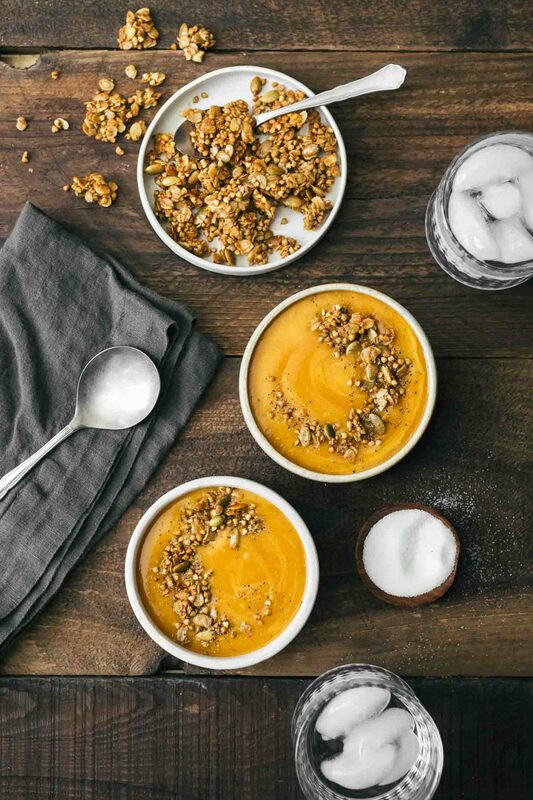 Divide the soup into two bowls and top with granola before serving. Tips & Tricks: This soup is perfect as a make-ahead and freeze option. If all you do in this recipe is leave the coriander/cinnamon combination alone, you’re good. I love butternut squash with almond cream or a pumpkin version with millet in place of the brown rice. There’s a few alternatives here that work well. Butternut Squash: Swap the sweet potato for butternut squash, pumpkin, or even carrots. 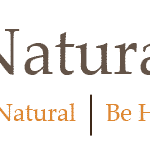 Nut Creams: I love the bit of richness the heavy cream adds to the final soup taste; however, you can leave this vegan by using a bit of almond or sunflower cream. Grains: The brown rice helps thicken the soup but millet would also work.